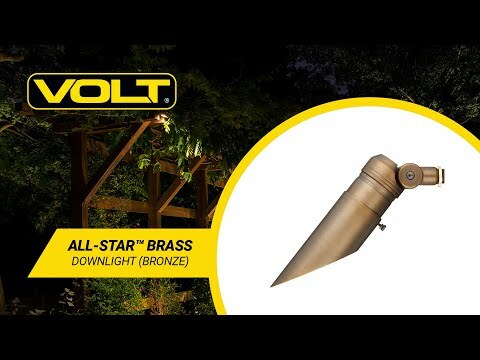 Cast brass, adjustable, durable fixture for downlighting & moonlighting applications. This fixture has been designed specifically for downlighting & moonlighting applications. It includes several innovative features that prevent water from entering the fixture. Its 40 feet of lead wire allows for simple, easy, and clean wire splicing no matter how high you install the fixture. Its robust knuckle with 42 locking teeth ensure your fixture stays fixed in its intended position for years to come. Solid cast brass construction for long life. Uses MR16 LED Bulbs . 40' lead wire so you do not need to make a visible splice on the tree. Large knuckle with 42 interlocking teeth for precision aiming with maximum lockability so the fixture doesn't adjust over time. 360° weep holes surround the faceplate to allow water to drain. Fixture body was designed to prevent water from reaching the socket in the event of water intrusion. Fully adjustable glare guard that allows any moisture inside the fixture to drain out no matter how it is adjusted. Locking groove in fixture body helps keep the glare guard locked in place when guard is fully adjusted inward. Includes a surface mount. Additional mounting options are sold separately. Safe, low voltage fixture for easy and worry-free installation.